Riot Games have loud ways of dealing with the very worst players in one of the best free PC games around, League of Legends – like the tribunal, and the head-on-a-spike reports that follow their rulings. But one of the quieter tools in their arsenal is the temporary chat ban. Not only does it dissuade players from bad behaviour, say Riot, but it actually tends to improve their performance in the lanes. 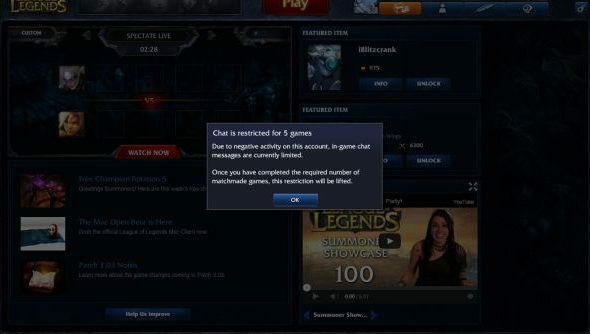 One player in the League of Legends forums wondered aloud whether chat restrictions effectively prevented offenders from playing in Ranked matches for the duration of a ban. But Riot lead social systems designer Jeffrey Lin reckons the inability to talk tactics doesn’t necessarily correlate with an increase in losses. In fact, he’s noticed some of the opposite. “Actually, we find that many players never chat at all and only use smart pings and perform pretty well,” he wrote. Lin added that Riot have considered restricting players from Ranked mode if they’re subject to a penalty – and ominously suggested that we’d hear more information about that in the future. I’ve been playing a lot of Mario Kart 8 lately, and that’s only reinforced a conviction that chat limitations can improve the atmosphere of a game no end. There’s no swearing or shouting there – only death glares and Scooby-Doo “I’ll get you next time!” emoticons. It’s the same reason I hope there’s never such a thing as Hearthstone text chat. What’re your feelings on the matter?